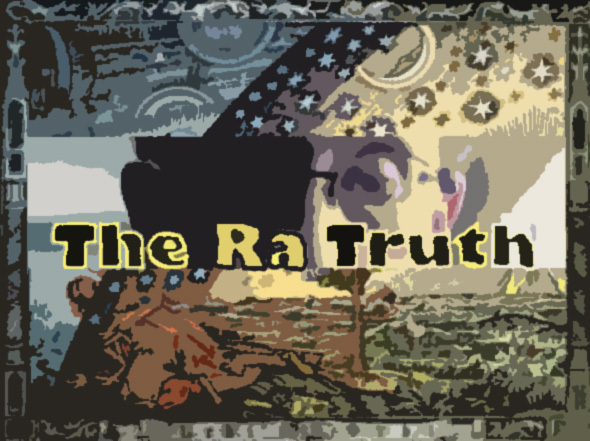 The Ra Truth: Star Presence! You thought it was going to be easier than this. The gearshift wasn’t working and you had to figure out why. It was stuck in Park when you had somewhere to be and you weren’t taking kindly to this delay. Maybe it was the heat—it was broiling, after all: 90 degrees with a lot of humidity—or maybe the damn thing just couldn’t take it. So after frantically trying to jerk it out of its seemingly frozen position and getting nowhere, you decided to wait a few minutes to see if that had an effect. Nothing. More waiting in the heat. Another effort. Still nothing. So you started wrestling with the smaller levers on the other side of the steering column and…wait a minute! It just moved! You’re in Drive again! You don’t know how it happened or why, so you just floor it and take off, content to not know for now. Later on, you’ll give that rental car company a real raised-voice lecture, up-close and personal. But for now, you decide to just concentrate on where you need to go. And that’s the energy of this week. With both “Lights” (Sun And Moon) in their strongest positions this week, and a New Moon occurring as well, not to mention a tough-as-nails but useful Mars-Saturn conjunction, the keynote this week is MANIFESTING PERSONAL POWER. We are in the Dark of the Moon period, the last phase before the New Moon in Leo on Friday—a time when energy should be focused on finishing up projects so they can be released into the wilds of the world under the New Moon. Anything that isn’t living up to your standards needs to be brought either to a halt or to completion. That includes creative projects, relationships or as-yet umanifested ideas in your head. With the Sun moving into the third decanate (10-degree division) of Leo, this is a culmination point for matters of self-expression and passions of the heart. In astrology, the month is divided into three parts, with a particular element, of which there are of course four—air, fire, water and earth—giving its underlying “flavor” to each month. The month of Leo corresponds to the element of Fire—inspiration, action, creativity per se, spiritual force. Early Leo has an undercoating of Aries, the first Fire Sign, meaning that the first 10 days are good for starting things. (People born during this time often just can’t sit still. They are souls used to action.) 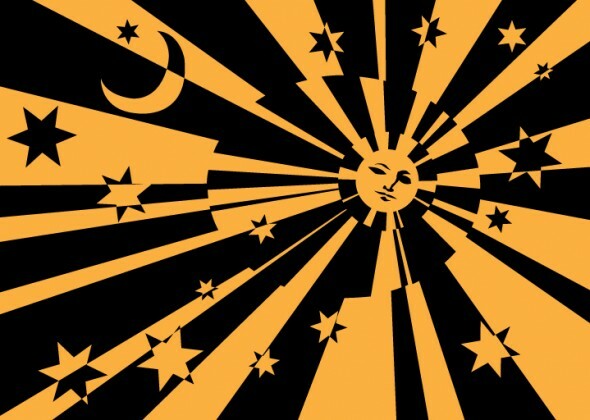 The second ten days are a Leo-Leo energy, so the creative power is at its peak. In the last ten days of the astrological month (our current position), Leo has a subliminal Sagittarius flavor to it. This is a time to aim for the heavens, like the Centaur with his bow and arrow, and raise both our goals and our personal energy. Because the New Moon occurs late in this astrological month, we have a longer prep time than usual for our creative projects and matters of the heart. But when the New Moon actually occurs on Friday, August 17th (8:56 am PDT/11:56 am EDT), it is a powerful and important moment. All New Moons are seed points where we can release our energy and creative projects into the world with confidence. Leo being the natural ruler of self-expression, publicity and personal oomph, if you are not manifesting a magnetic presence during this period you are missing out on a great opportunity. The lead-up to the New Moon has the actual Moon also in its strongest position, moving for most of three days through the sign it rules, Cancer. Moon in Cancer is about emotional nurturance and security issues. Home and family are important, along with feeling loved. It’s a great time for a stroll in the woods or by the sea, taking along your pic-a-nic basket, as Yogi Bear would say. Not only that, Mars (energy and action) runs alongside Saturn (discipline and structure) all week, with the actual conjunction occurring at 25 degrees Libra on Wednesday at 3:36 am PDT. Disciplined energy pays off this week. It may take a while to get things in gear, but once that happens, everything runs smoothly. But it could also be a time of great frustration if you are not constantly at it, so be forewarned. Let’s make it simple: Energy and discipline this week, good. Lack of mental focus and physical debilitation, not good. So which place would you rather be? This week, you may be forced to choose. And with the Uranus-Pluto square still in effect, providing much opportunity for change in our lives, but not a lot of security or peace unless we make it ourselves, this could be a stressful week for the unfocused. So prepare accordingly. How many dawns have you seen for the sake of a single syllable? How much coffee (or better, green tea) have you drunk because you can’t leave the painting you’ve now begun? How much do you want your goal, and what are you willing to do to get it? IT IS ONLY LONG EFFORT OR STRONG FOCUS THAT GIVES MASTERY. If you’d give everything, you’ll get everything…and this week gives us the opportunity to pay the price in order to reap the reward. Be diligent, and it will pay off. ARIES (March 20-April 19): The Fire Down Below turns out to be a Ring of Fire that you can jump into and out of this week. You have the inclination to find a pot and stir it. Passions are your friends and Connection your middle name this week if you can keep your hands from scalding. Still, the burned hand teaches best, said Gandalf, and we want your hands free to grasp truth. TAURUS (April 20-May 19): It’s a beautiful day in the neighborhood and Mr. Rogers just resurrected himself in your cozy little basement. Or at least his doppelgänger. If there was ever a time for you to stay home and meditate on a new and wonderful dream, this is it. You have to put in the floorboards before carpeting the place so this week for you is all about a new foundation. GEMINI (May 20-June 19): The Muse has decided to make you work for her favors, but She still is twinkling in your direction. This week’s energy is a combination of easefulness and laboriousness. It’s like cleaning out the commode for guests who are about to arrive—a necessary, but impression- making, bit of business. Hint: scrub the mirror, too. Your image is important. CANCER (June 20-July 19): It’s not that you’re moody, you’re just deeply impressionable. Okay, you’re moody, too. This week is like a forest night where the stars and moon are so bright that you can see your path even at midnight. Especially at midnight. Trust your deepest instincts now and see how they take you toward enchanted ground, not trodden before in your life. LEO (July 20-August 19): They say that the crown lies heavy on the head of the king, but for you this week it’s as light as a feather. In fact, the Golden Present is where you want to be right now, because the molten flow of energy takes you swiftly toward your goals as long as you pay attention to the signs. You know, the ones that say “Hail, Caesar!” and not just in Vegas. VIRGO (August 20-September 19): There’s so much happening behind the scenes for you right now that you could be the stage manager of a Broadway show. Maybe you already are, in your own life. In any case, this week’s about as close as it gets to being a run-the-past-out-of-your-life-as-fast-as-you-can sort of scenario. You’ll leave tire treads on others, but it’s allowed. LIBRA (September 20-October 19): Why is there a hand on your back as well as a skateboard being shoved under your feet? Because you’re being pushed to get moving, that’s why! The energy this week supports you, but is an indication of greater speed in your life as well. Make sure you know how to maneuver around those curves because the pace is picking up for you. SCORPIO (October 20-November 19): The tent flap opens and in walks the grandest Poo Bah you’ve ever seen. Then you realize that all you did was catch a glimpse of yourself in the mirror. Your future self, which you now need to manifest even if it’s a dream. It’s not the entrance you make so much as it’s the presence you exude, and if anyone knows how to exude, it’s you. SAGITTARIUS (November 20-December 19): The Sun is glinting off the braces of the young girl in front of you, it’s gleaming from the office window next door, it’s illuminating your very soul. And all because you’re welcoming it into your life and not resisting…or shouldn’t be. Sometimes all we need to do is open our arms and Light jumps in. This week, catch it all! CAPRICORN (December 20-January 19): How do you go about catching a fish in a murky stream with just your hands? Answer: Be patient and keep feeling around. This week is about you doing due diligence on what kind of fish (or dream) you’d like to have. Be careful—you could catch a barracuda. But more likely it’s something fresh you’ll have to cook up yourself. Ready? AQUARIUS (January 20-February 19): Congratulations! You’ve decided to marry. Now all you have to do is find the right person. It’s a little backwards but, hey—it works for you. This week is about salivating at the goal first and then putting the proper pieces into place in your life. The fact that you are now running on intense desire is a long step toward the altar. Taste the cake! PISCES (February 20-March 19): Last week you almost nailed your hand to the floor. This week, you’re in training to be an expert carpenter…or at least to learn how to handle a hammer. Being receptive to what others can show you frees you up this week to be the example rather than the goat. You can turn the worst bit of wood into a masterpiece if you aim your hammer well. NEXT WEEK: The ointment comes out and the maid cleans up after the party, but the hollerin’ continues as it just moves down the street. Join us as the Sun goes into Virgo, Mars enters Scorpio and we all decide to be clean and extreme…next time in STAR PRESENCE! CLICK HERE FOR A PERSONAL READING WITH RA! Ra Rishikavi Raghudas is an author, screenwriter, poet and longtime yoga teacher. He has been a professional astrologer for over 30 years. 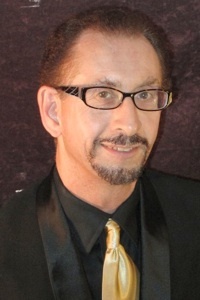 His clients include many prominent individuals in the business and entertainment fields.